Setting up data regions is quick and easy. There are no minimum seat requirements, you can change your covered data’s location at any time, and all data moves are completed within months. In addition, you can assign as many organizational units (OUs) to a single data region as you want, and you can have multiple regions set for the same domain. Visit the Help Center for instructions on how to set up G Suite data regions. We make it easy to manage your data regions on an ongoing basis. For example, when a file’s owner changes or moves to another OU, we automatically move the corresponding data accordingly—with no impact on the file’s availability to collaborators (e.g. no downtime, no read-only access restrictions, etc.). Similarly, if a new user joins your organization, their data is automatically located based on their specific OU’s policies. Finally, as an added benefit, we give admins up-to-date insight into the status of their data moves, so they can stay on top of any changes they’ve made. At launch, you’ll be able to designate data regions for primary data in the following G Suite services: Gmail, Calendar, Drive, Hangouts Chat, Docs, Sheets, Slides, and Vault. Over time, we’ll add support for additional content and services. 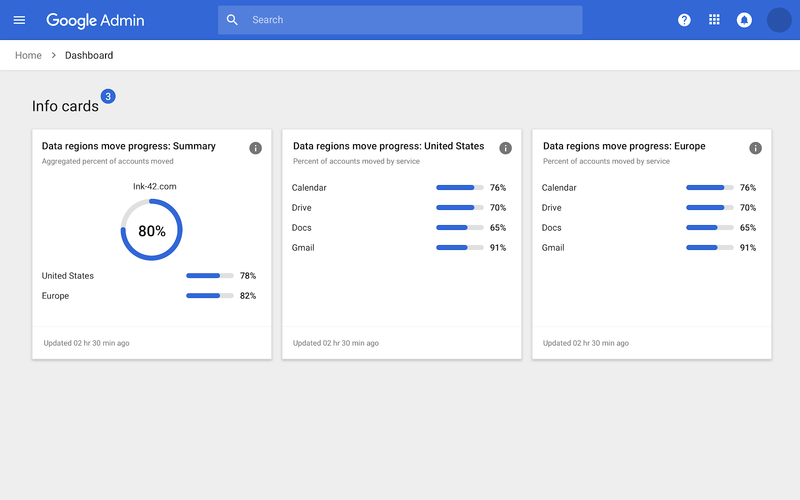 Visit the Help Center for more info on how G Suite data regions can give you greater control over your data. Our globally distributed data centers reduce latency for multinational organizations and protect their data with geo redundancy. Some organizations, however, have requirements around where their data is stored, and we’re committed to meeting their needs. 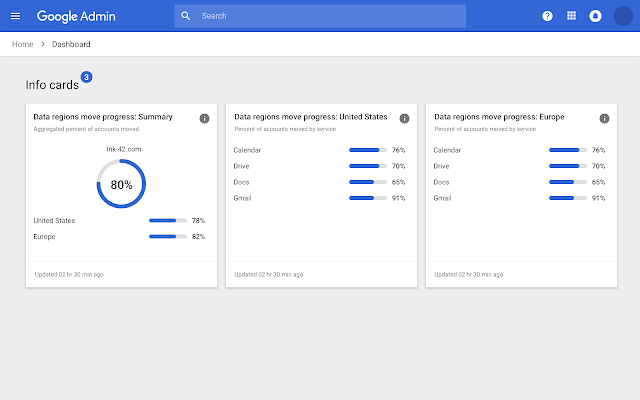 As a first step toward that commitment, we’re making it possible for G Suite Business, Enterprise, and Enterprise for Education customers to designate the region in which primary data for select G Suite apps is stored when at rest—globally, in the US, or in Europe.